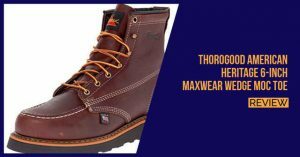 Thorogood is a brand used by many in the US and since the brand is also native to the US, the boots have become a trusted brand and the technology and materials are chosen from the highest quality areas. The Thorogood Moc-Toe Wedge-Heel Non-Safety is a combination of a work boot and the comfortable moc-toe shoe. 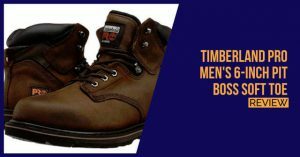 It is constructed from premium grade leather and while it does not feature a steel toe for protection, the toe area is quite large, giving you more room for more comfort if you have wide feet. 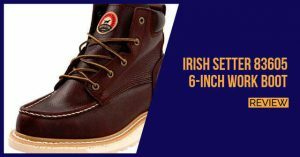 It features a synthetic outer sole and while this might not be as durable as we have seen some of the rubber outer soles in the other boots, it is still lightweight and brings down the price a little as well. The pattern is unique on the boot and it has the ability to resist any oil and water spills, which means that you will never slip. 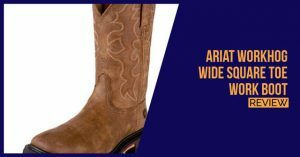 The style is the main feature that will set the boot apart from the competition and it looks great on your feet as well. Thanks to the tanned leather design, the boot should work well with any wardrobe and it does not show dirt as easily either, making it a great boot for walking through arduous terrains. 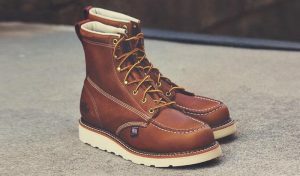 For what you get with this boot, it might be a little overpriced, but Thorogood is one of the more expensive and mainstream brands in the US. 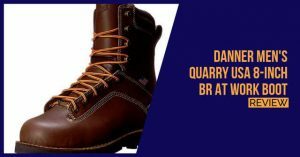 If you are an avid lover of the brand, the boot will certainly be what you need and we believe this is one pair of work boots when it comes to working factories.